Salesforce has been a dream partner. There's so much synergy between the relationship-building support both of our companies facilitate. Loop & Tie today announced that it has been selected as a finalist for Dreampitch at Dreamforce 2017, a competition designed to recognize startups that have built their technology on the Salesforce Platform. The second annual Dreampitch is held at Dreamforce, the most inspiring technology event of the year and the world's largest gathering of Trailblazers. Loop & Tie has been selected as one of three finalists for Dreampitch 2017, for its innovative work: a technology-enabled gift choice platform that lets businesses manage corporate and client gifting with reduced cost and higher customer engagement at scale. Loop & Tie will have the opportunity to pitch their company on the main stage at Dreamforce, in front of thousands of attendees and a panel of judges comprised of industry leaders and business experts. The judges will select one winner to receive a $250,000 investment opportunity from Salesforce Ventures, Salesforce’s corporate investment group. The Loop & Tie platform brings corporate gifting into the age of personalization and choice while delivering valuable customer data and creating additional sales touch points for companies. The company was born out of the need of founder Sara Rodell's own experiences in corporate gifting. “Salesforce has been a dream partner,” says CEO, Sara Rodell, “There's so much synergy between the relationship-building support both of our companies facilitate." “Salesforce’s Dreampitch gives early-stage startups the opportunity to showcase their business idea to potential customers, partners, investors and industry experts.” said Leyla Seka, EVP, AppExchange and host of Dreampitch. “We are excited about the amazing finalists and innovations for this year’s Dreampitch." “Salesforce Ventures is committed to empowering and fueling our ecosystem," said Matt Garratt, VP, Salesforce Ventures. “Dreampitch is a great way to see what innovative, early stage companies are building on our platform and we are excited to once again be a part of it." Dreampitch at Dreamforce 2017 is a contest designed to recognize top startups whose products are built on the Salesforce Platform (Lightning, Force.com or Heroku). Finalists will present their business pitch live to a panel of judges on Tuesday, November 7th, 2017 at 4:30 p.m. at Dreamforce in San Francisco, CA. Salesforce, Dreamforce and others are among the trademarks of salesforce.com, inc. 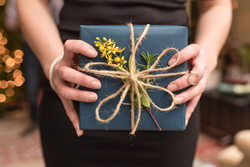 Businesses use Loop & Tie to recognize and reward customers and employees with a gift choice experience that lets them select the item that’s most meaningful to them. Through the online platform, companies save time and money while gaining new insight on recipient preferences as well as the ability to use gifting as a new channel for communication.